Alejandro Zapata is an Authorized Rhino Trainer (ART), and a self-taught 3D artist. 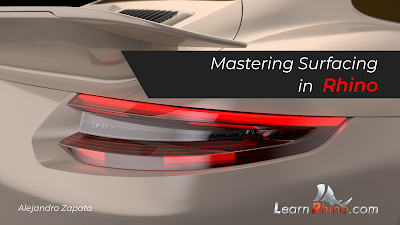 He has published his book, Mastering Surfacing in Rhino and it’s aimed for anyone who wants to improve their surfacing skills and achieve curvature continuity surfaces without plugins and expensive CAD software. It’s a detailed step by step exercise to model a car and includes detailed illustrated explanations to why we use commands in certain cases starting from a blueprint. A final model like shown in the video below. Watch this video to see what you can learn from Zapata’s book (in Spanish here). If you would like to purchase or learn more from the book, visit this link. Posted Jan 22, 2019 by Andres Gonzalez on Rhino News, etc. Nice! thanks for this post! The server is temporarily unable to service your request due to bandwidth limit has been reached for this site. Please try again later. XD This is no longer a problem.